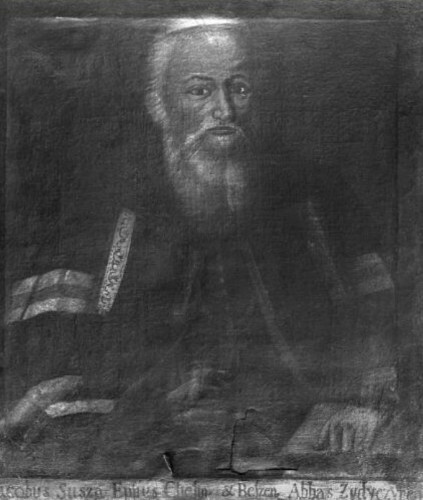 Susha, Yakiv [Суша, Яків; Suša, Jakiv], b 1610 in Minsk, Belarus, d 4 March 1687 in Kholm. Uniate bishop of Kholm. He joined the Basilian monastic order in 1626 and then studied in Prussia (1626–32) and Olomouc, Moravia (1632–6). After several postings he was brought to Kholm as a lecturer at the gymnasium and assistant to Bishop Metodii Terletsky. When the bishop died in 1649, he became administrator and then bishop (1651) of the Kholm eparchy. In the wake of Hetman Bohdan Khmelnytsky’s uprising, Susha proved to be an exceptional diplomat. He negotiated with Cossack leaders, and in 1664–6 he lived in Rome as delegate of the Uniate church to the papacy. There he persuaded the pope to name a new Uniate metropolitan of Kyiv, healed a serious rift in the Basilian order, and obtained an agreement prohibiting Catholics from changing their rite. He also led the drive to beatify Yosafat Kuntsevych. Susha's writings included biographies of Kuntsevych and Meletii Smotrytsky. A collection of his extensive correspondence was published in Rome in 1973–4 in Litterae Episcoporum, vols 2–3. Irynei Nazarko published Susha's biography in Zapysky Chyna sv. Vasyliia Velykoho (1971).